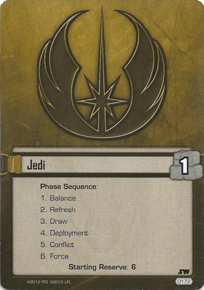 Teaching Star Wars » The Shadow Archive - Analyzing and Creating some of Fantasy Flight Games' Living Card Games. Focuses on Star Wars, Lord of the Rings, and Call of Cthulhu/Arkham Horror. 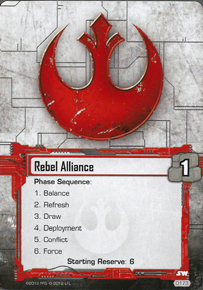 I’ve been thinking a long time on what makes Star Wars: the Card Game so unique and special, and how to teach such a complex game in a way that draws new players in rather than overwhelming them. Hopefully these thoughts are as valuable to you as they’ve been to me. About 6 months ago, I visited some of my close friends in Seattle, and of course I brought my Star Wars cards with me. After all, one was a huge Star Wars fan and a bit of a gamer, and the other a huge gamer and a bit of a Star Wars fan. Surely they’d be easy sells to play what’s arguably my favorite game! Yet when I taught both of them, they ended up being interested in learning but ultimately not interested in playing beyond the first game. This seemed crazy to me! I’ve since realized just how complex a game this one really is… and that makes it very difficult to learn. Most games can be explained fairly easily, if you take away the individual card text. Magic boils down to spending mana, attacking, and blocking. Conquest requires only the understanding of alternating deployments, warlord assignment/command, and alternating strikes during battle. 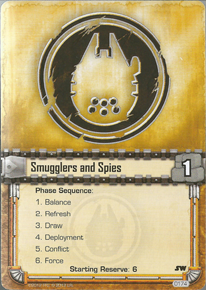 Netrunner can be as simple as “play ice, make runs.” Star Wars has the unique difficulty of having to manage several very complex mechanics at once: conflict assignment, the edge battle, strike economy, combat icons, and the Force struggle. To be fair, the reason I and so many love this game has a lot to do with the complex minutae of its rules. Managing your cards, resources, and strikes, while also saving as much back for the Force Struggle as possible, is a big reason this game is so fun. But it also makes this game have the highest initial learning curve of any game I’ve played, and unless a player is truly dedicated to going deep it’s going to be hard for Star Wars to have a positive first experience. Unfortunately, that’s the unstated crux behind whether a game can work or not: is it fun? If a game isn’t fun the first couple times you play it, nobody’s going to want to play it except the most diehard players. To that end, when teaching a new player how to play Star Wars: the Card Game, your goal should not be to teach them all the rules. Your goal should be to teach them why they should like the game. The first trick to getting someone invested into something you love is to make it familiar. Nothing turns people away like an overwhelming amount of foreign information (why do you think it took me so long to get into Game of Thrones? Because all my friends’ attempts to convince me to read it came with the warning “BTW if you ever stop reading for a bit, it’s so complex you’ll lose track of what’s going on”). To that end, it’s most important that the game be approachable, and approachable means—to a certain extent—simple. In order to achieve simplicity with a complex game such as this one, you need to make sure you prioritize the most vital and exciting pieces of the game and present only those. 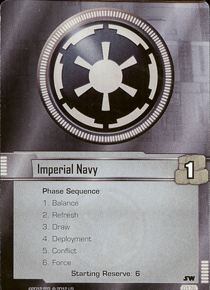 Don’t attempt to explain strategy, or deckbuilding, or why The Tarkin Doctrine is overpowered. Your #1 priority is to get your friend playing the game. That’s the second trick to getting someone invested: to get them involved. Everyone learns differently: some visually, some aurally, and some kinesthetically. Regardless of how they learn, it’s easier to understand how and why a rule or game mechanic works when they’re seeing it play out before them. And that requires an active game. So one of the first things I believe you should do, when teaching someone how to play Star Wars, is to get them playing. Don’t bother explaining everything beforehand—in fact, that’s probably a bad idea. All your friend needs to know is enough of the game’s rules and mechanics to play out the hand they’re dealt. Most games, but especially this game are attractive because they reward skill and intelligence, and it’s not rewarding when you’re so busy trying to keep track of resources, engagements, edge battles, and Force struggles all on your first turn that you feel like you’ve made a mistake somewhere. Assuming you’ve given a basic overview of how to read the cards, and you’ve gotten them playing through their first turn, it’s time to lean back and let them run the show for the moment. Just as you don’t want to overload your friend with a lecture on game mechanics, you also don’t want to rush them through the game. Let them figure out what their cards do, and how they want to manage their resources on their first turn. Don’t tell them about something unless they have to know it, or unless they ask. In fact, the more questions your friend is asking, the better of a position you’re in, because that means they care enough to want to learn. Most importantly, however, don’t introduce theoretical problems for them to worry about. They have enough to worry about just figuring out how to optimize their deployment, maybe even with an eye towards how they want to attack. Don’t make their work more difficult by telling them they also have to also consider that Characters are vulnerable to Force Choke, or that Twist of Fate exists, or that they could get blown out by Unfinished Business (more on this later). Let them take their time, figure everything out, and ask as many questions as they have. Let them signal when they’re ready for the next facet of the game. The very first introduction any player is going to have to the game is the pitch. What is the game, and why should they play it? Before you teach the game, you need to convince the new player that it’s worth playing. This shouldn’t be very hard; if you’re reading this, you probably love the game as much as I do, and if you’re teaching your friend then you have a certain amount of credibility already established that makes your enthusiasm meaningful. But you want to start by introducing them to the big picture, so they understand what the game represents, why cards behave the way they do, and what their goal should be when they play (so they can see that they’re getting closer to success). I’d start with the asymmetry of it, that the Dark Side is gaining power via the Death Star dial and it’s up to the Light Side heroes to stop them. Explain what objectives are: they’re the plots, plans, and operations occuring throughout the galaxy that need to be stopped. You can point out that by destroying an objective and increasing the Dial, you’re instilling the fear of the Death Star as it obliterates planets and Rebel Bases throughout the galaxy. Play up the theme of the game—a lot of people find the game very “un-thematic,” but if the game is introduced to someone with a certain amount of abstraction then they’re more likely to accept that as the way the game is meant to be understood (if the Chimaera is attacking an objective, it’s nuking it from orbit, but if Darth Vader is attacking then he’s going in person and killing the enemy leadership). If your friend is already a gamer, you can play up the incredible resource management in the game, in that every card has a dual purpose on the battlefield and in an edge stack. Someone who enjoys Euro-style games is likely to be intrigued by the challenge of having to manage the cards in their hand, the units on the board, the resources at their disposal, and their strikes during combat. Everything has at least two uses in this game, which is intimidating to new players but very rewarding once you “get” it. Most important to any pitch, I think, is the edge battle. Far and away everyone I’ve talked to (including myself) has agreed that one of the most exciting, interesting, and special aspects of this game is the edge battle. It lets you bluff, making the game remarkably interactive. It lets you clear cards you don’t want from your hand so you can draw ones you do want on the next turn. It lets you gain an edge (pun intended) in combat so even if your units are weaker than your opponent you can still have an even fight. It’s a swingy mechanic to be sure, but part of the appeal of this game is its swingy nature. This is Star Wars, where the game isn’t over until its over, and even a weak board presence can eek out an unexpected victory when piloted well. There’s nothing more “Star Wars” than stealing victory right out from under your opponent’s nose! Note: One thing not to bring up in the pitch, unless you feel very confident in the new player’s gaming credentials, is the idea of objective sets. You can mention it in passing, perhaps, but since the new player isn’t going to be building decks right away it’s not information they need. In fact, considering the consequences of the objective set system (that they’d be expected to know a huge amount of the card pool to know what’s in their opponent’s deck) could be detrimentally overwhelming. If the new player really likes deep, complex games then by all means go for it, but this is a unique feature that I think a lot of people like to talk about (I certainly do) that I think should be left out of teaching sessions. Card cost. This should be pretty straightforward. Damage capacity. It helps that this is portrayed the same on objectives and units. Resource icons. I like Rahn and Leia’s sets because it shows that there will be resources on your objectives and on units/enhancements so you can generate more resources throughout the game. Edge icons. Don’t necessarily explain the details of edge battles right now, but pointing out that these bubbles help “win combat” or “take control the Force” (on units) will give them some context in terms of how to read them. Combat icons. Again, don’t go deep on this, but they should know that guns and tactics provide board control and that explosions damage enemy objectives to help win the game. Fate cards. Since they look so different from everything else, make it clear that these are simply free events that can only be played during combat. You can explain exactly how they actually go off when they get to combat. Feel free to mention game text as well, though that should be pretty obvious. They’re going to need to read every card they draw, which’ll make the first game go slowly, but that’s to be expected. Now, before you get started with your first teaching game, I want to make a few things clear. What I’m going to go through is the “default” method I’d recommend for teaching. If the new player ever asks questions about something, that’s the best position you can be in, because that says that they’re actively interested in learning more. Even if I explicitly say, “don’t explain this feature at this stage,” if they ask about it, go for it. You want to get them interested enough to want to learn, and you know you’ve reached that point when they’re guiding the topic that they’re learning. In addition, I’m biased towards kinisthetic learners because that’s what I am. I still stand by the claim that everyone learns better when they’re actively participating, but cater your teaching towards the person you’re teaching. If they’re aural learners, explain everything. If they’re visual learners, show them lots of cards (and board states). 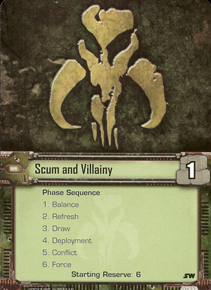 If they’re interested in the Star Wars movies then bias your deck selection towards those, but if they have a strong affection for a particular piece of the Expanded Universe then absolutely bring that out and have them play with that. Specifically speaking to deck selection, I’ve got a list of decks at the end of the article that I recommend for new players, both for the new player and for the teacher. I’ve biased my pod selection towards the original trilogy, as that’s the heart of the game and what most people like. Feel free to modify the decks to suit the flavor that the person you’re teaching enjoys, but there’s a few things I’ve purposely done that I recommend you stick to. Give the person you’re teaching a deck with two Twists, but give no Twists to yourself. I’ll explain more when I get there, but I believe it’s better for your opponent to discover powerful cards on their own without being told what powerful cards exist. The new player you’re teaching has enough to worry about in trying to figure out how to pilot their deck: they shouldn’t need to (or be told to) worry about what cards you could have. And you don’t want their first experience of Twist of Fate to be them blundering into it without knowing it exists. Allow your opponent to choose their favorite side and affiliation, of course, and give yourself the corresponding partner deck to teach with. Something that may come up is the idea of playing the first game with open hands. I would normally suggest it if this were another game, but due to the fact that edge battles exist I actually think it’s better not to. If the person you’re teaching requests it, absolutely play with open hands, but resist the urge to dictate optimal moves for them. The goal of teaching a new player is to have fun more than anything, and there’s nothing fun about having someone else dictate your strategy to you. As you can imagine, they’re not going to play optimally, they’re not going to trigger their effects properly, and they’re not going to make what, to you, seem like obvious plays. That’s fine. The best way to learn a system is to stumble around for a bit initially—if you allow them to fumble through their first game or two they’re going to pick things up far faster than if you demonstrated “proper” strategy. And who knows, maybe they’ll do something you never even thought of that’ll become critical in your next tournament. With both decks selected and shuffled up, it’s time to begin the game. Again, unless they specifically ask, let the new player figure out which objective to bottom (even if it’s the wrong choice), and let them decide how to mulligan. Now they’re not going to have any way to know what’s a “good” hand or not, but they can use the basic metrics I use when I’m playing: Does it have a resource and 3 or more total cost worth of units? Then keep it. If not, shuffle it away. In the spirit of having a good game, I’d allow them as many mulligans as necessary to get a hand that meets those criteria, but I leave that to your discretion (it shouldn’t come up too often). Then the dark side player will begin, deploy, commit, and then the light side player will deploy. Units are the most important cards in the game. The more units you can have on the board, the better. Big units are more powerful than little units. It’s better to play one 4-cost unit than two 2-cost units. Always play your resources first, since you’re going to immediatley use them to play your other cards. All events can be played as “instants,” or at any point during a player’s turn, so while they can be played during deployment they don’t have to. While it’s more important to have your best unit on the board, you want to play the cards that have fewer edge icons so your edge hand is better. Play as many cards as you can, unless your board is already well-established. Once they’ve played their cards, they’ll either commit someone or begin their conflict phase (depending on which side they’re playing). When it’s your turn to deploy, it’s worth explaining what you’re doing, why you’re doing it, and what your cards do. 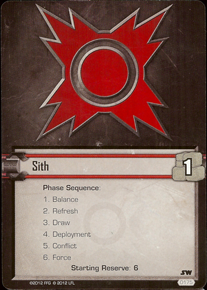 During the dark side player’s Force phase, regardless of who’s playing, it’s worth explaining how the Force struggle works, and why it’s important. That way both players know that it’s going to occur after the first conflict phase, and reinforces the importance of having Force icons on the table as opposed to in hand. A common practice in higher-level play is to constantly mention action windows. I’m not certain this is good advice, but I think it’s better to mention each action window as it arrives, so that the new player gets a sense of when they’re allowed to play their cards and trigger their abilities. This might be too intimidating initially, as every time you bring it up it could put them on the spot (should I play this event now? Is now a better time than what I originally planned? I don’t know!). However, giving a sense of structure, a sense of “I’ll make sure you know when you can use those effects, and teach you proper gaming etiquette from the beginning” seems like it would be valuable. Use your judgment, and as always provide your opinion in the comments below if you think I’m wrong. Also, allow all manner of takebacks, if they ask for them. They’re just learning, after all, they should hardly be expected to keep up with strict rules! Once the conflict phase arrives, it’s time to explain how conflicts work. Start with the big scale: engagements. It’s straightforward enough to say that they get to declare up to three attacks (one at each objective), and that the defending player may choose any number of participating defenders. That’s basically the same as any other game with an “attacking and blocking” mechanic, just split up into three chunks. Most importantly, this is when the edge battle should really be explored and explained. Once both players have committed characters, the attacker begins an edge battle. You can explain that technically the attacker doesn’t have to bid anything, though all ties go to the defender. Also explain that if your opponent has no participating characters (on either side) you automatically win edge, and that sometimes it’s advantageous not to block and sometimes it’s possible to maneuver a board state where your opponent can’t block. Explain why the edge battle matters, focusing primarily on the distinction between white vs black icons, and this is a good time to cover the different kinds of combat icons if you haven’t already. As understanding how combat icons work is likely going to involve explaining alternating strikes (as preventing strikes are the main use of tactics icons), it seems likely that this will come up here. It seems straightforward to people who’ve played, but resolving conflicts in this game is very complex, so it’s important to make sure the new player feels like they have a solid understanding of strike mechanics before continuing. The reason I advise waiting until this far in the game to explain how combat works is because the easiest way to really remember something is to put to use new information immediately after having it explained. That way after having “how to play your cards” explained, they immediately play their cards… and after having “how to resolve combat” explained, they immediately do that as well. This should bring them to the point where, at the end of the first turn cycle, they’ve seen the entire game and played through it more or less exactly as it’s played in the “real world.” From here on out, it’s all down to reading and learning all the cards, which is something that’s going to be true in every card game. When teaching any game, the #1 most important thing to the success of your teaching is whether the new player you’re teaching wants to play the game again. Even if they don’t know all the rules; or haven’t properly grasped the minutae of how actions, strikes, and focus tokens work, if they’re having fun and want to play the game again, you’ve succeeded at teaching the game. If the person you’re teaching understands the rules and can play perfectly well, but they’re not excited or even interested in playing again, then it doesn’t matter how well they know how to play. On the other hand, even if the person you’re teaching has a shoddy understanding of the rules but has the enthusiasm to keep playing, then you’re in a good spot. It’s far easier to learn and refine understanding rules mechanics than to attain a desire to play that isn’t there. Another thing is that in the first game with a new player (and the second, and so on), your opponent won’t make optimal plays. They might not even make good plays. Unless they specifically ask you for guidance, don’t correct them. When a player is making their way through a new game, they’re focused on what cards they have in their hand and how they can optimize that. They often don’t even care about their opponent’s cards until they’re actively interacting with them—which makes sense when you consider the fact that in a game where every card essentially changes the rules, the fewer cards they have to think about at a single time, the better. What you’ve just told the new player, who’s still figuring out what cards they have and how to use them, “Here’s a thing you’re not worrying about… but you really should be worrying about it.” This is advice I coined directly from Game Designer Mark Rosewater’s excellent podcast: “Once you tell them about a problem they don’t know, now they know those problems exist.” And if a game is presented to someone as a huge amount of problems they need to be worrying about right away, then they’re unlikely to want to come back to it. You’d be surprised at how many enthusiastic players I’ve seen attempt to teach strategy before mechanics. Don’t do it. The final piece of advice I have is in regards to playing against a player who’s playing for the very first time. Unless you’re also new to the game, you’re going to be much better than them; I could probably give you a deck with The Eater of Luck and give them the best Jedi list in the game and you could still probably beat them. While this is a head-to-head competitive game, it’s not interesting to defeat a new player, so I don’t believe it should be your objective. I don’t mean to say, “throw away the game to them,” because any half-decent player, no matter how new, is going to be able to pick up on the fact that you’re throwing a game. But this isn’t a tournament game, so don’t treat it as such. Your goal shouldn’t be to defeat the person you’re teaching, though it’s ok if that happens. Your goal should be to have the most exciting and dramatic game possible. You might have a 181st TIE Interceptor that’s just waiting to be piloted by Lord Vader, but you could put him on his own TIE Advanced instead to nail the theme. Or you could defend an attack against Luke Skywalker with Darth Vader even though Echoes Yoda is the bigger threat. You could be able to lock your opponent’s only defender out with a convenient Cloud City Operative and go in with Chewbacca for free, but it’s more fun when the big Mains clash and the edge battle really matters. You get where I’m going with this: try to make as many cinematic, exciting moments as possible. Also, embrace reversals. One of Star Wars’s greatest strengths is how swingy its games are, and how you can go from losing to winning in just the space of a single edge battle or conflict. Emphasize that, and try to make that happen as much as possible, even if it means giving up ground when your opponent starts attacking you. Seeing each player take a volley and trade off being in the dominant position makes for an exciting game worth coming back to. Nothing is as boring as a game where one person starts ahead, or gets ahead early, and stays that way. This is Star Wars, and anyone should feel like they can steal victory from the jaws of defeat. I want to wrap up with some decklists. I’ve said already that the new player should choose which affiliation they want to play as, and that you should play a particular kind of deck against them (no Twists, no means to wreck their strike economy, no blowout tricks like Guri). Here I’ve compiled all my suggested decklists, for both players, so you can browse them and see if you like them.